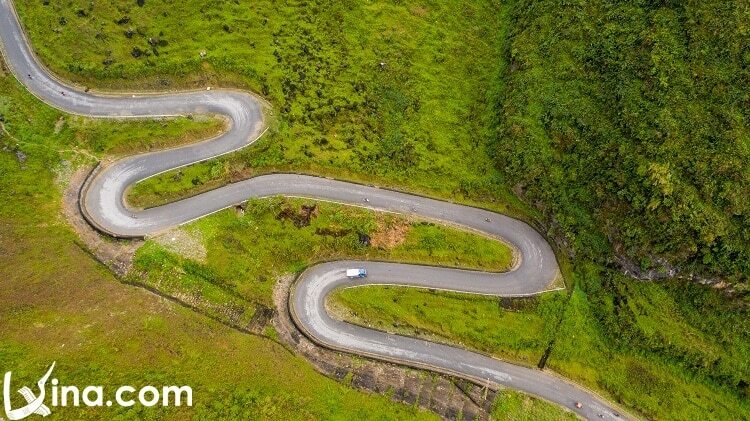 Ha Giang (Hà Giang) province, which is the final frontier in northern Vietnam (Việt Nam), is a tourist attraction with majestic and poetic scenery. In addition to Lung Cu (Lũng Cú) fragpole, Tam Son (Tam Sơn) Twin Peaks, Dong Van (Đồng Văn) Old Town, there are other things about Ha Giang attracting tourists from different countries. 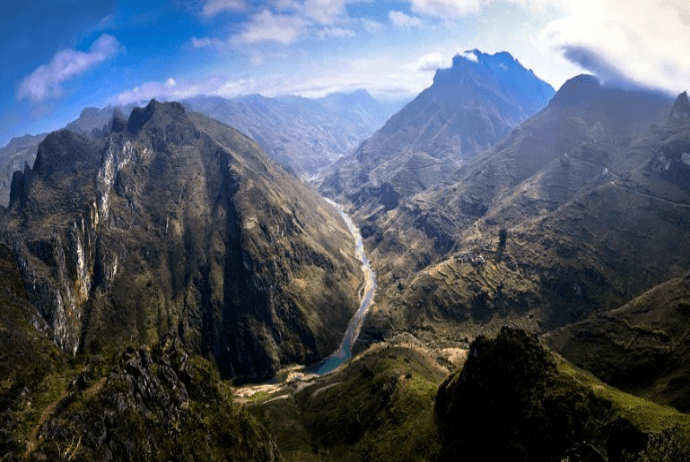 Here are some interesting things to do in Ha Giang for tourists to consider. 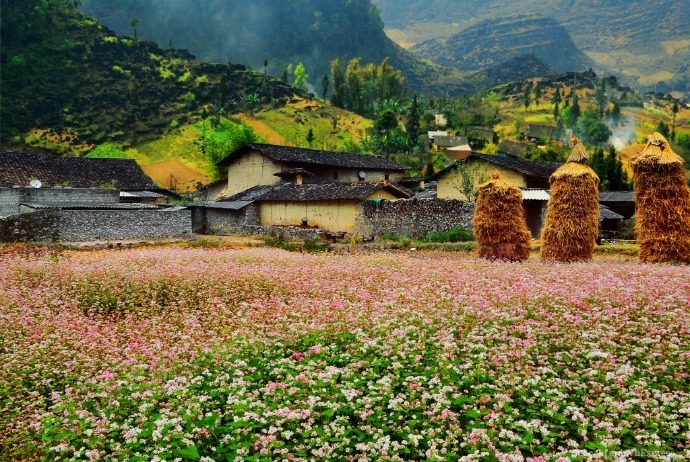 If you have a chance to visit Ha Giang, try to visit it in the flowering season because the plateau is beautifully embellished with the fresh colors. 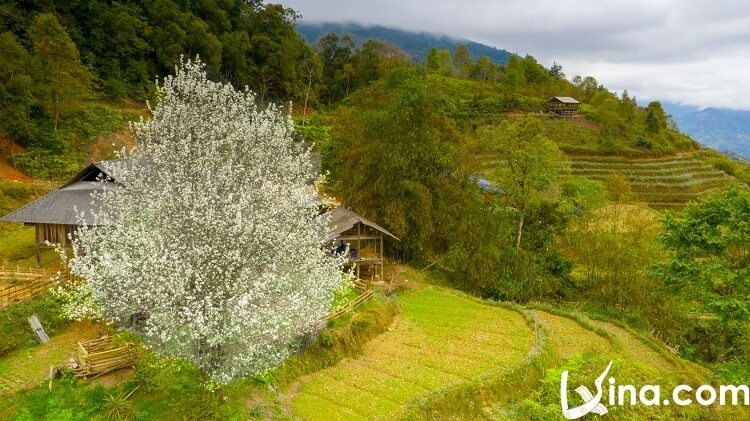 White plum blossom, purple of buckwheat, pear blossom, and pink peach blossom, of which buckwheat season will last from September to December and peach blossom, pear blossom, plum blossom is often after the traditional Tet (Tết) holiday. 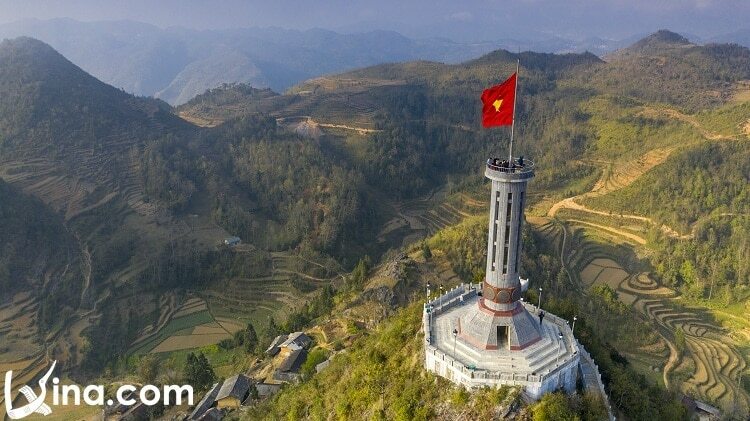 Going to Ha Giang, do not skip visiting Lung Cu, the northernmost point of Vietnam. Standing on Lung Cu Flagpole, you will see the flag that flutters in the breeze. If you are a Vietnamese, then it may be the most sacred moments in the lifetime. Also, witnessing the first point of Vietnam is the moment for love of the country and national pride. H’mong people are famous for their hospitality. They mainly account for Ha Giang’s population. 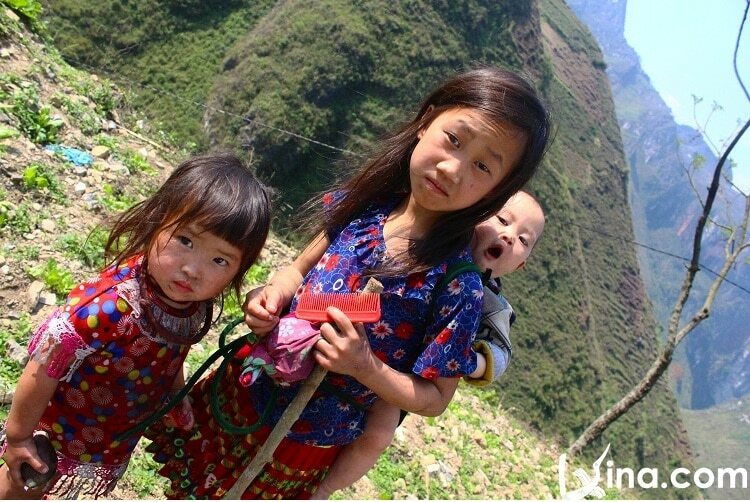 One of the great things to do in Ha Giang is to experience the daily life of H’mong families. Staying in their home, talking to them, eating and sleeping is definitely a cultural experience that you will never forget. There is a high rock cliff located on Tham Ma (Thẩm Mã) Pass. The challenge you could join in is throwing a stone to the cliff. Though it seems very close, the stones just go about halfway before falling down to the deep abyss. Thus, if you have a chance, give it a try! The corn wine in Ha Giang is rather heavy but very fragrant. When it comes to specialty of Ha Giang, you could enjoy a bowl of porridge of “thang co” (thắng cố) or “au tau” (âu tấu) and then drinking warm corn wine, particularly in a day in late autumn, right in the rocky plateau. Considered as the King of passes in the north of Vietnam, Ma Pi Leng has majestic scenery along with an interesting story about sappers breaking the stones and then paved ways on that craggy pass. If you stand on Ma Pi Leng’s top point and outstretch your arms, you will feel like you are flying in the sky. Indeed, the harmonious beauty of ground, sky, and mountainous scenes can steal the heart of any tourists. 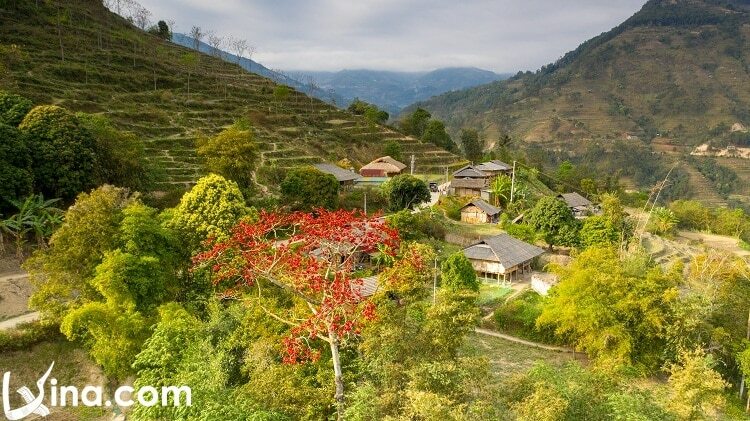 Because Ha Giang is well-known for the rugged slopes and passes, conquering slopes and passes here is one of things to do in Ha Giang that tourists should not miss. Cong Troi (Cổng Trời – Heaven Gate), Bac Sum (Bắc Sum), Chin Khoanh (Chín Khoanh), Tham Ma (Thẩm Mã), Ma Pi Leng (Mã Pí Lèng) are famous destinations that those backpackers should not miss during their trip to this land. Though they challenge the riders, but in return, they will be rewarded with the breathtaking views when watching those passes. 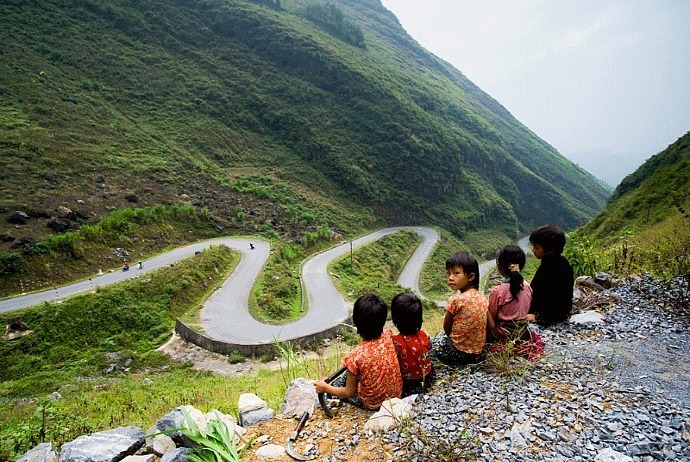 Starting from Ha Giang, Happiness Road runs through Dong Van rocky plateau, Ma Pi Leng to Meo Vac. About 200km in length of this path is bones and blood, is the myth of young people from 16 provinces of Vietnam, such as Cao Bang (Cao Bằng), Lang Son (Lạng Sơn), Bac Kan (Bắc Kạn), Tuyen Quang (Tuyên Quang), Ha Giang (Hà Giang), Thai Nguyen (Thái Nguyên), Hai Duong (Hải Dương), Nam Dinh (Nam Định). Over 8 years, 1200 people, 1000 volunteers, and 9 million tons of explosives as well as attempts poured down this road. When you go on the road, it is not about enjoying the beautiful scenery but also appreciating those people laid down for the path.